If you haven't started on your Christmas cards, you better hop to it!! 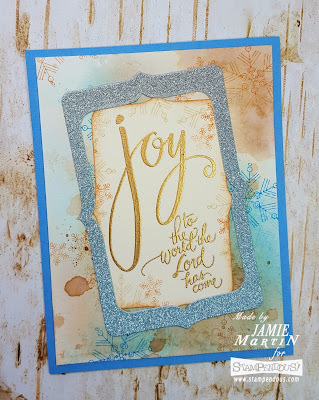 The Joy Has Come stamp from Stampendous makes for a quick Christmas card when paired with a watercolor back ground. 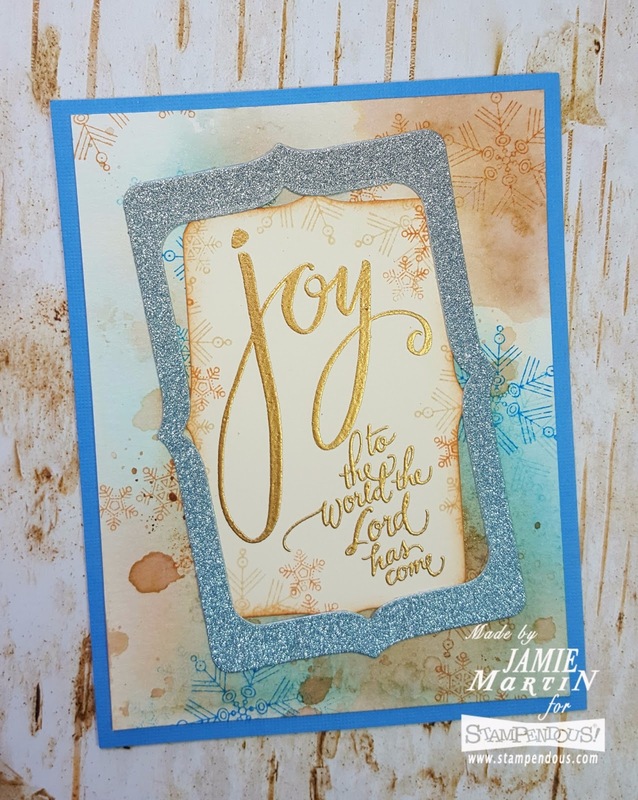 Joy Has Come was stamped with VersaMark Ink and embossed with Champagne Embossing Powder. It's then die cut with Fitted Frames and layered against a watercolor background made with blue and brown Distress Inks. A frame die cut from blue glitter paper is then layered over the sentiment. All week Stampendous has been sharing videos from Vicky Papaioannou and you will want to see these. Her projects are just beautiful! The Stampendous Blog has all of the links to her You Tube videos. This is gorgeous with the embossing and the watercolor background. Such a beautiful color combination, Jamie, and lovely colors. It's the textures that really grab me! The champagne color embossing makes the card stand out. The shiny and rustic element combination makes a very pretty card. What a nice look. I love the colors, and how you made it glitzy, but not too glitzy. The slight cocking of the focal point is a nice touch, too. Pretty background and color combo to feature this lovely sentiment! Unique, modern & beautiful card! Think I need to get that stamp--just love it! I mailed most of my cards on Wednesday. make and send (my daughter, son, etc). I'll get those this weekend. Love the stamp and your design. The watercolor and embossing are beautiful.